My egg-laying ladies have just finished another record-breaking week. The new record is 38 eggs, or 3.8 eggs a week per bird. I am expecting an average next spring of about 5-6 eggs per bird, so we are still several eggs a week short of that, but we are getting there. If things go as they have in past weeks, they should lay a total of 42-44 eggs this week. Seven eggs, including a new green one. 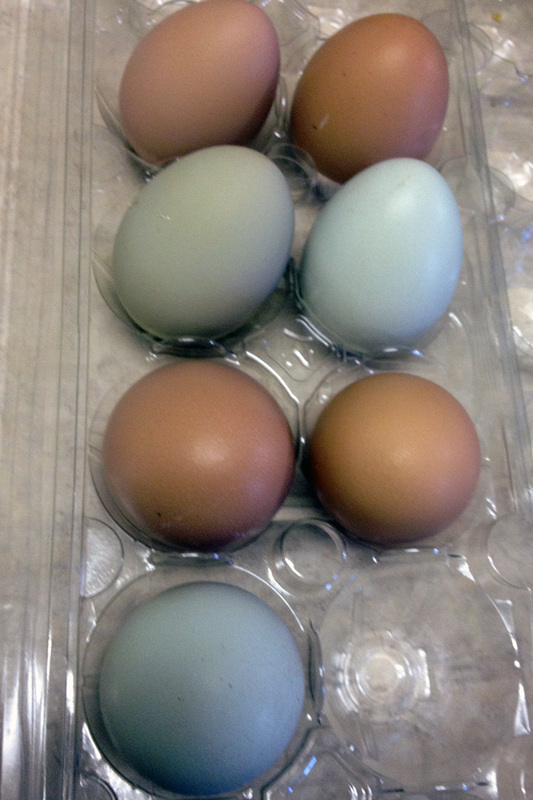 The color isn’t perfect in this picture, but the green egg is the second one from the top on the left. One last comment on the eggs for now – last night we had breakfast for supper. There were enough eggs laid in the last few days to feed my entire family. Woot! This entry was posted in Chickens, Pictures, Videos and tagged in Americanas, Aracanas, Blue Egg, Colored Eggs, Easter Eggers, eggs, Green Egg, Rhode Island Reds.